At one point, my struggle with Obsessive-Compulsive Disorder had brought me to a place of complete desperation and hopelessness. The fact that I was a Christian made matters worse. The common consensus among professionals is that this mental illness is something you must learn to cope with and manage, but that it will be with you your entire life. However, due to God's intervention and a series of events spanning the course of a decade, I now live totally free of this mental illness. This is my story (includes journal entries). B.J. Condrey is married to Allison Stegall Condrey. They have one son, Ezra, and a daughter, Rhema. They currently reside in Edinburgh, Scotland, where he is a PhD candidate working on his doctorate in “Theological Ethics” after receiving a partial scholarship from the School of Divinity at the University of Edinburgh. He holds a B.A. in Philosophy, a B.A. in Psychology, and a M.A. in Philosophy. He served as a staff pastor in various roles (youth, college, small group, hospital visitation) at Grace Fellowship in Winnsboro, Texas and then at Resurrection Life in Picayune, Mississippi. He has taught philosophy at four different schools including Whitworth University and Gonzaga University. 3.0 out of 5 starsNot everyone's story of OCD is the same. I like this book because of it's transparency in relating how Religious OCD/Scrupulosity can impact an individuals life. I like it because it gives a clear message concerning the Gospel of Jesus Christ and what it means to be saved by Grace. The author's experience is certainly well worth sharing and how God came in and brought relief through various mean demonstrates His love and care for His children. The only concern I have is that in reading this, the Christian with OCD might suppose that they haven't yet grasped what Grace truly means. It's important to be careful not to think that one size fits all concerning how this form of OCD manifests itself in the individual or that for the Christian, that the lessons of affliction will be exactly the same. comfort of His presence or the joy of my salvation. It was and still is only because I have OCD and it's very common to have it latch onto and threaten those things which are nearest and dearest to me. It was not because I had a spiritual problem that needed correcting. OCD is a highly nuanced disorder and effects Christians and non-Christians equally. The CBT approach is the same for all OCD themes: My own OCD has come at me in a lot of different ways, from various forms of Harm OCD, to Health based OCD and finally Religious OCD/Scrupulosity. I also have Panic Disorder and Social anxiety Disorder. Anxiety disorders run in my family. I have found E.R.P. to be effective for all my OCD themes. My Religious OCD is not an exception to this rule. ERP in combination with time and lots of it allows for the brain to habituate to OCD themes. I've also used meds. for some of my OCD flares and I've also gone without meds. for some of them. It all depends on how severe and/or debilitating the flare is. And, while there are certainly lessons and purposes and a chance for growth in all kinds of affliction those lessons may differ from person to person. to walk in faithfulness to Christ. I found that my story of Religious OCD was closer to that of John Bunyan and that I can chime in with Mr. Bunyan by saying that "God doth order it for my good!" I've had many seasons in my life where I would say that my OCD was so inactive that I felt totally cured. But having reached the age of 60 I've found that the disorder waxes and wanes. I've found that it flares up with chronic health issues, hormonal shifts, big life changes etc. None of that matters, because not unlike the apostle Paul, I've learned that God's Grace is sufficient for my affliction; my weakness. I've learned that the affliction has a purpose and therefore, "I will boast all the more gladly about my weaknesses, so that Christ's power may rest on me." It's more than okay to live with OCD. God's work in my life has not been impeded by the disorder. My OCD has been a tool which God has used to cause me to focus more on Hiim; His power, grace, and strength, rather than to rely on my own strength. It has humbled me. And that's a good thing. Before I read this book, I really had no idea about OCD and wasn't really interested since I had never (consciously) met anyone who suffered from OCD. Almost all references to OCD I had heard in the past were in the form of a joke, like "You're so OCD. Chill out" and similar. But since have recently gotten to know the author, I thought I'd grab a copy of his autobiographical book and give it a read. B.J. does a good job of blending his personal narrative with data and general information about OCD, and walks readers through his personal journey with the illness and how he found freedom in Christ from the perfectionism that fueled the fire of his OCD. Overall, a short, engaging read with relevance for both those who suffered from OCD or those who know them, and also people more broadly who deal with addictions or feelings of unworthiness or shame. 5.0 out of 5 starsExtremely well written. If you're dealing with OCD or if you just want to understand through a very raw first hand account. I have never read anything like this before. These words touched my heart deeply over the full spectrum of emotion. I laughed.. I cried.. I got angry at it. But this book made me realize that I wasn't just a lone tormented soul.. No offense at all, and I would NEVER wish this on anyone, but it was nice to know that someone else dealt with the same thing I did. Nobody I knew loathed the thought of turning on a light switch because of the sequence that had to follow.. I felt 100% nuts.. but I too was healed through God's amazing grace.. My dad put his hands on my shoulders one day as I sat at the dinner table struggling within myself and prayed over me and God had mercy on me in that moment and started my healing.. If I knew anyone who was dealing with or dealt with OCD, I would make sure they knew about this book. There's help, there's hope and YOU'RE NOT ALONE! God is good! 5.0 out of 5 starsGod Can Heal Anything! This book is truly an inspiration, whether you or a loved one suffers from OCD or any type of anxiety. So many people in the church don't give the necessary hope to those who are suffering, because they've bought the lie that medication is the answer. Medication can help, but it isn't going to get to the root cause of the problem, or cure the person. Only our loving Jesus can get to that, and I believe He will, for those who completely trust Him and His love to do it. Jesus is still The Great Physician! Let Him heal you for good, even if it doesn't happen in your timing. I'm not even sure where to begin. 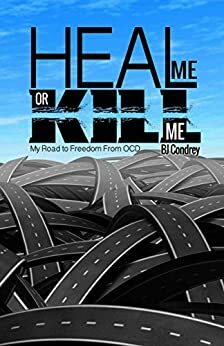 This book is geared specifically towards individuals who have suffered with OCD, but I walked away with so much more considering the fact that it is not the fight in my life. No matter what battle you find yourself in at this point in your life, this book is for you too. What I love the most about books like this is that it gives hope. There is so much vulnerability here and the author is very honest. Quick and easy steps to freedom are such a turn-off because we all know that in reality it doesn't happen that way, and B.J. is quick to let you know that. When I hear stories of real people who have dealt with real struggles and have truly been set free, that sparks hope. It sparks new life and the willingness to keep pushing through the crap. I found myself tearing up towards the end of the last chapter because it was as if Jesus was sitting right in front of me telling me not to be discouraged with where I am at. Read it for yourself and you just might find that you walk away feeling the same way that I did.